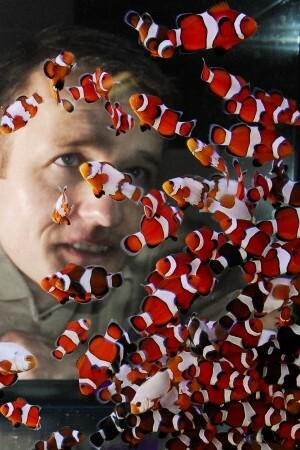 With the decline in wild groundfish populations, there is considerable interest in developing efficient techniques for raising cod, halibut, and haddock on fish farms. Researchers at the University of Maine are studying both the nutritional needs of larval cod and haddock and the type of food needed to maximize healthy growth in the early stages of these fish. 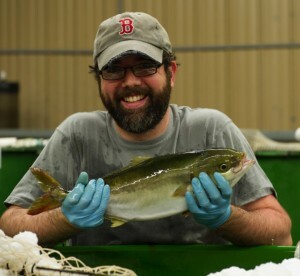 The University of Maine’s Center for Cooperative Aquaculture Research (CCAR) is experimenting with different ways of hatching and raising haddock and halibut on a commercial scale. In recent years, both black sea bass (Centropristis striata) and California yellowtail (Seriola sp.) 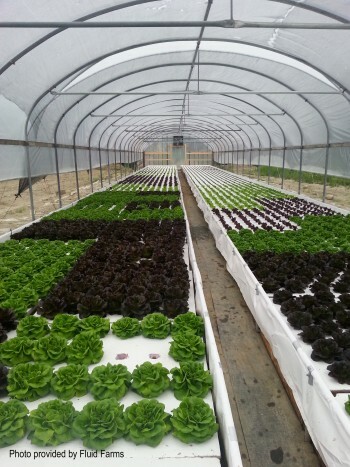 have been raised in a collaborative effort by CCAR and industry partner Acadia Harvest, Inc.
Sea & Reef Aquaculture, LLC rears a variety of marine ornamental species in their land-based facility at CCAR. Established in 2003 by Soren Hansen, the business currently occupies a 12,000 square foot facility in the aquaculture business incubator. The northeast’s first commercial eel production facility operated by Sara Rademaker is currently rearing juvenile eels at the Darling Marine Center aquaculture business incubator in Walpole, ME. Aquaponics startup Fluid Farms operates a multi-trophic integrated culture system rearing hybrid striped bass with lettuce, herbs and various other greens in a greenhouse setting.